Here’s what I’ve been working on – waffles and ice cream. It is, we think, a great option for the winter in our shops, especially this winter with all the gloomy recession talk and abounding worries. Hopefully a warm waffle with ice cream will be pure luxurious comfort for our customers. Somehow, I think, it’s also quite appropriate in terms of all the recent news and government climbdowns :-). I still haven’t the recipe quite right, but I’ll post it when I do! mmmm… that’s just amazing! 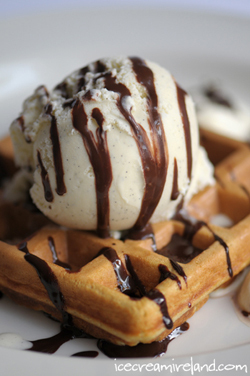 what better way is there to eat ice cream than with a warm, freshly baked waffle? thanks, looking forward to recipe updates! We sell fresh waffles and icecream in our shop too – the smell of them just draws people in and makes you hungry for them yourself! Mmmm – perfect with a steaming mug of hot cocoa! !